From time to time, Casual Kitchen receives review copies of new cookbooks. My goal is to warn you away from the bad ones and draw your attention to the good ones. Here's one of the best I've seen in a while. 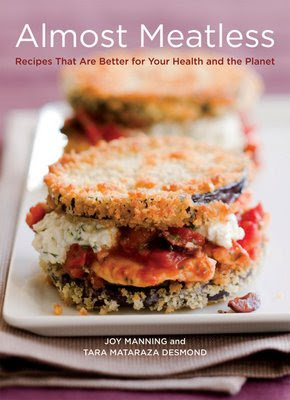 I've found a cookbook that matches the food philosophy here at Casual Kitchen perfectly: Almost Meatless, by Joy Manning and Tara Desmond. Are you trying to make your diet healthier, but you're not ready to commit to strict vegetarianism? Are you looking for a collection of intriguing recipes that will help you adopt a more conscientious diet and cut your food bill? Then this cookbook is for you. Joy and Tara start from a premise that Casual Kitchen readers will fully appreciate: most Americans eat far more meat than they really need. But these authors don't run to the opposite extreme and ram vegetarianism down our throats. On the contrary, both freely admit they eat meat and have no interest in cutting it out of their diets. I think of Joy and Tara as "moderates" in the vegetarian debate. The recipes in Almost Meatless are generally quite easy. They avoid showy and expensive ingredients that you can't find in your grocery store, and yet these recipes still grab you because they combine ordinary ingredients in highly creative ways. Exactly the kinds of recipes that pass my Five Easy Questions Test. A few favorites that stood out to me: Shrimp and Slow Roasted Tomatoes (page 52), Sweet Potato Chorizo Mole (page 78, a casserole-style dish that will literally leap out of this cookbook directly into your recipe filebox) and African Peanut Stew (page 35, an exotic recipe that looks like it could be made in under an hour and for less than $2 a serving). I hope to blog about each of these in the coming months. Of course I expect a cookbook to have great recipes--otherwise I'd never recommend it to readers. But Almost Meatless goes further still, providing extensive information on the proper care and handling of various meats, as well as an extremely helpful chapter on stocks and broths (the recipes for veggie stock and mushroom broth are both worth noting). And at the very end of Almost Meatless you'll find something you almost never find in even the very best cookbooks: a list of recommended food-related titles for further reading. Joy and Tara's reading list includes some expected books, like Michael Pollan's In Defense of Food and Barbara Kingsolver's Animal, Vegetable, Miracle, but it also suggests some interesting lesser-known titles like Aliza Green's cookbook Beans and David Joachim's The Food Substitutions Bible. I love this feature, and I think every cookbook should include a solid reading list just like this for those readers who want to learn more. The only (minor) criticism I have for this otherwise exceptional cookbook is the omission of prep and cooking times with each recipe. I consider cook times a critical tool to help readers judge which recipes they'll have time to make on a given day. I hope Joy and Tara include this feature in their second edition. You can buy Almost Meatless for $15 at Amazon, a surprisingly reasonable price in the era of the $50 celebrity-endorsed cookbook. I'm glad Ten Speed Press took a chance with these first-time authors--we're all the richer for it. I highly, highly recommend this cookbook. This looks like my kind of cookbook! Thanks for the review and recommendation. Oh, wow ... that looks like a great cookbook, Daniel. I found your comment about the cooking/prep times interesting. With The Daring Bakers that is the number one question we get from people! Great review! Thanks so much for this terrific write up! Here's my thinking on the prep time issues: there are so many variables (what do you consider medium on your stove? How fast can you chop an onion? Do you have a food processor?) that it's less annoying to leave it out and let people estimate the times based on the instructions and their own experience. I promise, though, that we'll revisit the idea if we do a volume II. Thanks again! Thanks for the review, it's so hard to know which cookbooks are worth buying or not. This is exactly the mentality that I'm talking about on my sweet potato post! I am totally into a flexitarian way of thinking. Kmays: Anytime. Thanks, as always for reading me! Creampuff: Thanks for stopping by and sharing your positive vibes. Hi Joanne: That's why I think I'm going to dedicate more time to reviewing cookbooks here at CK--I think many people feel the same way you do. I hear you. I guess I see it as a convenience so the reader can tell, at a glance, which recipes they might have time to cook (or NOT have time to cook) on a given day. Admittedly the times will be different for different people--that's a wrinkle I didn't think about. But I still feel that a reasonable, average guesstimate would be another tool for the reader. Come to think of it, though, I have seen devious cookbooks that systematically underestimate their listed cook and prep times so the recipes seem easier than they are! Thanks for weighing in with your thoughts. You and Tara brought a great cookbook into the world. I'm sold! Honestly, their moderate approach sounds quite similar to my own ... and that sweet potato mole sounds divine. Thank you so much for this informative review and the recommendation. Love it! That African Peanut Stew sounds great! Hi Daniel, my husband has gout and I'm trying to cut back on our meat consumption w/o actually having to give it up. Everything I've made from the book has been delicious and my husband hasn't even noticed the dishes are purposefully low on meat! REALLY great recommendation, thanks for the tip! I can't remember if I bought it from your amazon link, but I'll do it next time for sure! Oh, and yes, I would have also liked prep/cooking times. Priscilla, thanks so much for your feedback, and I'm so glad you found value from my review!